How often do we hear about the dangers of bullying, intolerance and peer pressure, especially in schools? Constantly. And yet, that is exactly what the ridiculous “walkout”—the one pushing for more “gun control”—by students at a bunch of schools is*. No, it was not the kids’ idea. At all. No, those bogus “interviews” with the students, supposedly recorded during the Florida shooting, are not in the slightest bit genuine. If you think that anyone currently in fear for their lives would be discussing new legislation, you need to watch less television. 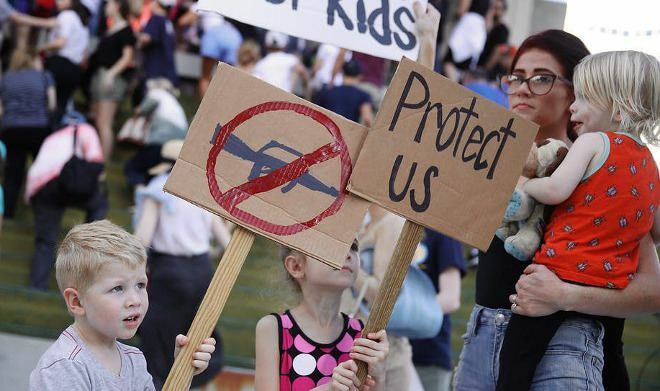 These poor, ignorant children are being bullied and pressured—by teachers, parents, the media, and their peers—into joining this completely fake and fabricated “demonstration,” so the power-happy psychos in “government” can pretend that their latest peasant-disarmament plan has something to do with “saving the children!” To use kids in this way is downright revolting. It’s also rather telling how the political left targets the most ignorant among us, using fear and emotion to get them to cheer for their own subjugation. A hell of a lot of Americans know next to nothing about guns, nothing about what current gun “laws” say, and nothing about what stupid legislative agendas are being proposed now. And most children know even less about it. So to have them protesting and “speaking out” is a combination of ridiculous and disgusting. What could be creepier than that? Well, I know at least one thing that’s creepier: watching the children then publicly cheer for the predators and parasites who sold them that lie. Completely aside from the specific issue (guns), this type of propaganda and exploitation is revolting. What’s next? Pushing the “Social Security” Ponzi scheme by getting kids to march in the streets to keep “mean people from making our grandparents starve to death”? Or maybe promoting the surveillance state by telling children that evil people are going to do evil things to them, unless big brother is allowed to keep an eye on what everyone is doing. Now that I think about it, a whole lot of supposed adults in the U.S. think the way small children do—meaning they feel more than they think, are profoundly ignorant, easily confused and swayed, and can be led around by their fears and emotions, and tricked into cheering for their own victimization when it is called “protection.” A perfect example of this is the grown-ups who are also demanding more “gun control.” The difference is, adults should know better; they should have the understanding and intelligence not to fall for that crap. Instead, a whole lot of them are raising their children to be another generation of unthinking, obedient subjects, looking to an all-powerful ruling class to protect and take care of them. And that’s just sickening.